Who turns his eyes towards the sky with the naked eye during a clear night – at a sufficient distance from sources of light pollution – can, with a little patience, make some simple observations about the motion of the stars, which are the source of the astronomical conceptions of the ancients and they still determine to a large extent the way in which common sense and ordinary language refer to celestial phenomena. Our hypothetical observer will escape with difficulty the impression that its position is immovable, and situated in the middle of a hemispherical “dome” full of stars, named “celestial sphere” which is defined by the line of the horizon. If the observer to extend his observation, he will realize that this “sphere” is not immovable: indeed he will notice that every star moves – together with the others, that is without changing its distance from them – and it goes along a circular path whose centre is a point on the straight line joining its own observatory with a point of the sphere, located to the north, in proximity to a star, the “Pole Star”, the only one which is immovable among the others (to be precise, being close to the centre, it performs an almost imperceptible movement). The closest stars to the Pole Star go along a circular path that nowhere crosses the horizon so that they are visible at any time of the night. The path of the most distant stars is only partially visible: they appear on an east point of the horizon and, after crossing the sky, they disappear on a west point. Similarly to the latter the Moon behaves. Similarly the Sun lights up sky and earth during its daily motion from east to west and it hides with its light the other stars and thus it determines the alternation of day and night. 1) While the path drawn by the stars do not change – they “arise”, in every season, at the same point on the horizon, and they always reach the same summit point, and “fade” in the same place – that one of the Sun changes seasonally. 2) The motion of the Sun appears “slower” than that one of the “fixed” stars.Taking as a reference a star that is in a certain period near the Sun it is easy to verify that – compared to it – the Sun loses ground (every day about one degree of angular distance, which is equivalent, in terms of time to about four minutes). This means that, as regardsthe background of the celestial sphere, the Sun seems to cover backwards a short daily path.This motion backwards leads the Sun to pass successively in front of each of the twelve constellations of the Zodiac, along a line called ecliptic, which is inclined at 23° 30′ compared to the celestial equator, and then after a year to return to the point from which it was calculated the beginning of the motion.The seasonal variationsof the daily path of the Sun are a result of the annual shift of the star along the ecliptic. 3) The Moon “degrades” to the East very quickly, “losing” an hour a day, and it ends in a period of about twenty-nine days its path backwards on the background of other stars.The path described by the Moon in this eastward motion is not far from the ecliptic, even though it does not coincide with it. 4) In comparison with the background of the stars, also the planets perform a backwards/retrograde motion (in greek Planetà, “wandering stars”), five of which can be seen with the naked eye, and they were known in ancient times (Mercury, Venus, Mars, Jupiter, Saturn ).But the planets have another “anomaly”: their backwards/retrograde path – at certain times – seems to slow down and to stop (this is called “station” of the planet), and then this is replaced by a motion in the opposite direction (for this reason called “retrograde”): in this case the planet gains ground, instead of losing it as to other stars, it moves westwards faster than the whole starry sphere, and then it returns, after a certain time, to its usual motion eastwards. In all, the eastward motion of the planets leads them to describe paths which do not differ much from those of the Sun, but that present an S-shaped or a ring-shaped evolution next to the stations and retrogradations. 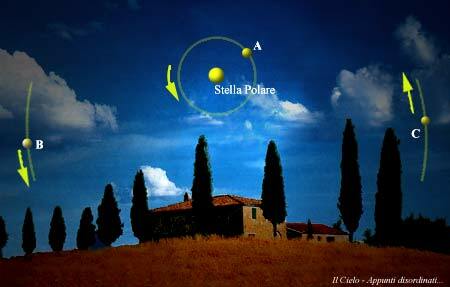 5) During the phases of the retrograde motion the planets appear brighter; also the apparent size of the Sun varies. Since ancient times these phenomena have generated in the observers the idea that periodically these celestial bodies come close and, respectively, move away from the Earth. (SHEET from the book “the philosophical text”: Volume I, the ancient and medieval ages, pp. 646/647; F. Cioffi, G. Luppi, A. Vigorelli, E. Zanette – EdizioniScolastiche Bruno Mondadori).